Summer is here and it’s the perfect time of year for some outdoor learning. This summer my daughter and I have begun learning foraging. My 5 year old is naturally interested in learning to forage as she is always looking outdoors for things she can eat. Honestly, it’s my duty to learn this with her so she learns what is poisonous and what she can and should not eat. She knows dandelions are safe to eat, so whenever she sees one, she grabs it, and plucks the little flower petals to eat just as if she was eating a bowl of popcorn. A few weeks ago at dance class, I caught her handing out dandelions to the kids in her class and she told them to eat the dandelions because it was healthy for them. Even tho her manner came off on the bossy side, they oddly all listened to her and ate their flower. She also often eats clovers she finds, wild strawberries and well any herb, fruit or vegetable in my garden. She enjoys the idea of picking and eating. This year I was too busy to do much of a garden, so it was a great time to learn to eat what nature already provides for us. My first job was to tackle me learning this valuable skill. I can’t teach what I myself don’t know. I began by collecting books on the subject from the library, a local book store and online from Amazon. Very quickly I had quite a pile of books to go through. After weeding through them all, my favourite by far were two books written by the same author, Samuel Thayer. Ever meet someone so knowledgable about their subject, that you wish you could just follow them around for a while and try to mentally download as much as you could from them? Well, had I met the author in person, I’m sure he would be one of those people. His books are packed with first-hand knowledge from a life-time of foraging. His experiences with each plant he writes about, is written in such a way that one might be tempted to read each book from cover to cover. I started out that way, but quickly realized if I wanted to retain the knowledge, I personally would find it best to pick his brain (aka read the chapter) of one type of plant, berry, root, nut or grain at a time, and then take some time to apply and experiment with that knowledge on our own. The first challenge is finding and positively identifying a plant. There’s a chart in the books of when different plants are in their peak season, so my daughter and I choose a plant that would be ripe during the time of our search. We look through the many colour photographs and pick a plant we remember seeing at some point. Then we keep our eyes open for it on our almost daily nature walk together. When we think we’ve found what we’re looking for, we take a small sample back home to study it more closely to make sure we’re making a 100% positive identification. I usually do the identification part myself, and afterwards I go through each part of the plant with my daughter, and we examine the identifying characteristics of that particular plant, and discuss which parts are edible, and which are not. Once we have gone through the effort of identifying a plant, it then becomes extremely easy to find in nature from then on. I can’t get over how much food is hanging out in our neighbourhood, just waiting for someone to pick and eat it – and we do, especially my daughter. Her favourite past time outside is eating. On our walks, we are constantly discovering new sources of food in our neighbourhood. Even on our own property, we’ve found a variety of fruits we didn’t even know we had or existed. It’s fun trying new foods with my daughter. Sometimes we might not like a particular taste, but there’s something about picking your own food that even when we didn’t like it so much, we both kept going back for more. And most of the time it’s about knowing which pieces are ready to pick, and that comes with experimenting and tasting. invaluable skill that will very likely benefit future generations – your child will probably pass their knowledge down to their children, who will in turn teach their children, and so on. I’m not going to lie, I’m pretty sure my daughter has eaten several insects. I am trying to teach her to check things carefully before she eats them, but similar to teaching your children about germs and the importance of washing hands well, this concept is going to take a bit of time to sink in. We’re still working on her understanding of not everywhere being safe to pick, removing dead or less than ideal looking pieces and checking for bugs before eating. With trying any new foods, there is always the possibility of having an allergy to a food. It’s always best to practice and emphasize safe foraging practices with our kids. Limit trying one new food every few days, so if there is an allergy you will be able to identify which food is the culprit. We haven’t had any issues but it’s just a good safety precaution. Also make sure kids know importance of only eating food that they have 100% positive identification for so they don’t eat something they shouldn’t. I know my daughter wanted to pick a plant just because it had 3 leaves at one point, so I had to stop and reemphasize to her all the different characteristics of the plant we were searching for. But not to worry, once you’ve properly identified a plant, it becomes very easy to pick out in the future – much the same way you would easily be able to identify a banana or a lemon. Overall, I love that my daughter is able to identify some plants by name and is learning what she can eat and how. We will probably spend many summers learning this skill together. But there is more to learning about these outdoor treasures than how we can eat them. We can also learn which plants have medicinal properties and are good for healing. 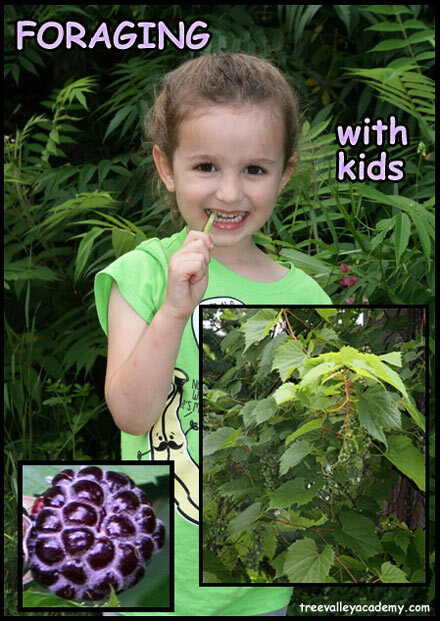 More on great ways for kids to learn these valuable skills and more on foraging with kids in upcoming posts. Foraging sure sounds like my kind of activity. I love spending time in nature with kids doing something productive and learning fun things at the same time. I don’t know, if you are interested, but I would mention just in case. I’m part of a Homeschooling Moms with Blogs facebook group and we are looking for one more mom to join. The purpose of the group is to support each other in our blogging/homeschooling adventure. I would be interested Eva. What is the name of the group so I can join? always great to spend time with kids in nature! My grandson who is 15 months loves the garden so I can imagine him foraging in the future. Thanks for sharing your ideas with us at #AnythingGoes.